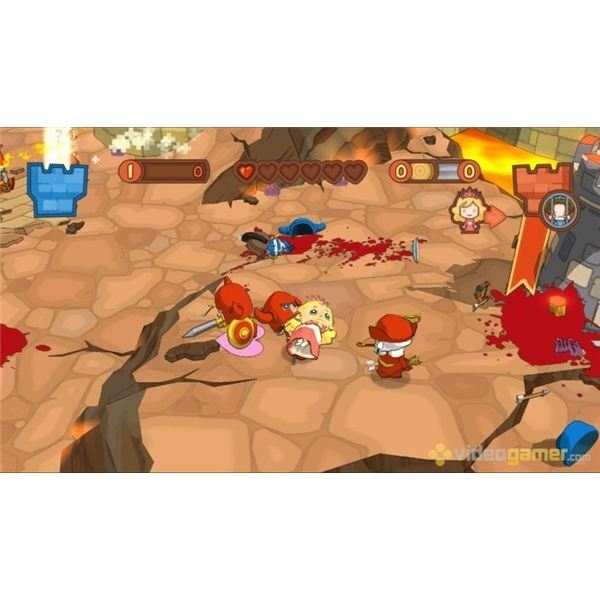 Fat Princess is a game only available on the Playstation Network for the PS3. Everyone with a PSP needs to wait for the mini-version called Fat Princess: Fist Full of Cake. 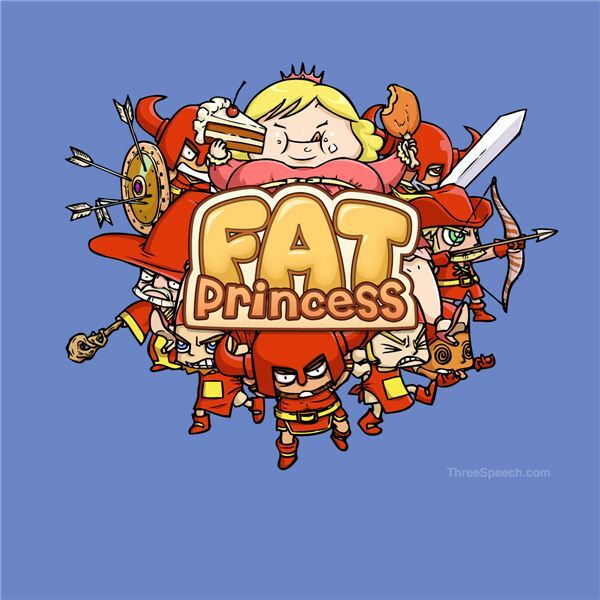 However, for the full version on the PS3, there is a lot in store for us, but for those of you with no idea what I’m talking about, the name Fat Princess is quite a video game title. To be brief: The Ledgend of the Fat Princess is thus: Once upon a time, two princesses were frolicking about in the mystical kingdom of the blue and red castles. They stumbled upon a gigantic cake! They were curious, and so took small nibbles. But after the first taste, they became insastiable, and continued to enduldge themselves until they were no longer the pretty skinny princesses, and became behemoth looking girls in red and blue dresses. Thankfully, the king noticed their princesses were missing and went looking for them, only to find the monstrosities we now know as the Fat Princesses. The story keeps going! However if you want to find out, I’ll let you play. The title may seem like a pun, and it is; however it is not mine to claim, it is Titan studios because ‘play with yourself’ is what they called their single player modes. In ‘play with yourself’ there are three modes on the PS3 for you to enjoy: The Ledgend of the Fat Princess, Skirmish, and Gladiate. The Ledgend of the Fat Princess is essentially a method of teaching you the game modes in multiplayer, along with telling the story in a childs book chapter method. The first is Capturing the princess, which is rather obvious, and then it delves into the five other modes that Fat Princess has to offer. Skirmish is simply that, where you may jump into a single player game with your custom rules to dish out some damage to some computer players. Gladiate is also as it sounds, you pick a class, you get one life, and you become a gladiator. This mode is essentially send waves of ‘dudes’ at you until you die. For a Fat Princess, this isn’t always a good time. I think the idea behind naming the single player mode ‘play with yourself’ is to discourage playing offline, because the most fun is had when you are playing with other humans who think, strategize, and can talk smack/coordinate over a mic on your PS3. I’ll go into further details about actual gameplay, but first let me stress that this game is made to be played with other thinkers. The computer that takes empty spots up until humans join almost always act the same, and that is they rush the middle, over and over. So, let me say just once more, only get this game if you plan on playing it online. Its even a better experience with a mic, so.. plug in your computer mic, or your phones bluetooth headset, I bet if you google it you can figure out how to make it work. That being said, online multiplayer in PS3 Fat Princess with a few people using headsets is one of the most fun experiences I’ve had in a long time. It is simple gameplay that everyone can join, and gamers can excel at. However above all else the gameplay iterations essentially force teamwork for victory. Having one person trying to carry a giant princess, full on cake, out of a castle of angry cartoon crusaders usually just ends awfully. Class Systems, they are in more and more games. I suppose it encourages teamwork, and its a good idea, but how is it implemented in Fat Princess? Worker: This class is in someways the most important, vital class. 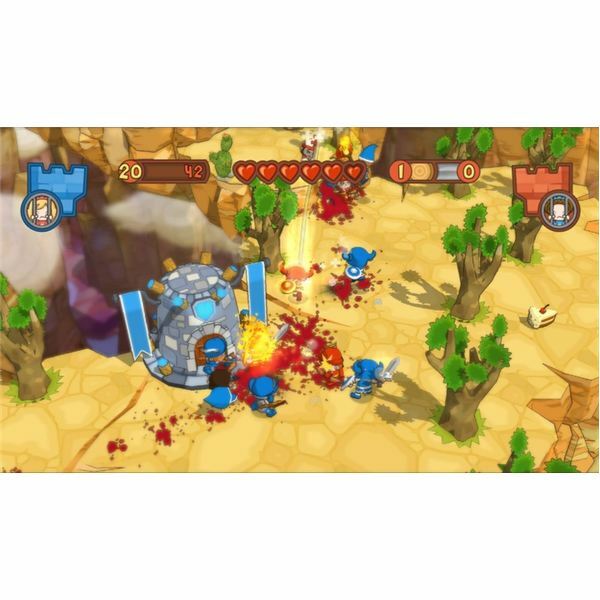 They collect resources, build your castles gate, and defences. They are also the only ones who can upgrade the specific Hat Machines for each class. Oh I didn’t mention that? One chooses their class by picking up a hat in front of these hat dispensor machines in your base. The worker can upgrade the machine, allowing it to spit out an upgraded hat for that specific class. The worker gains miniature throwing bombs in addition to his handy axe, which allows him to do his resource collecting. For a quick explanation, the two resources are wood which can be collected by chopping down trees, and minerals which can be mined in the middle of maps. This resource is usually stategically placed so the teams have to fight over this precious upgrading material. Warrior: Probably the most straightforward this shield sword wielding class is the tank of the game. They are the back bone to invading the castle as they can take the biggest beating, but it is rather satisfying to slice another characters clean off his cel shaded body. When upgraded the warrior receives a Lance type weapon with which he can dash with to catch up with those pesky retreaters. Ranger: Starting with a bow and arrow the ranger deals damage from a much safer range than the warrior. When on a castle wall the ranger gains cover and height advantage, from which he seems to greatly benefit. When upgraded he receives a Blunderblass-type shotgun which allows him to deal greater damage when violent warriors come a-charging. Mage: The mage comes in handy when large groups of enemies are knocking on the front door of the castle, simply charge up that area of effect fire spell and send them flying to the river to cool themselves off. The mage is very good at dealing damage to a large amount of people if he can stay behind enemy lines. When upgraded the mage receives another spell, an icey blast that allows the mage to retreat or go in for a sneaky princess napping. Priest: Initially the job of the priest is to keep everyone alive, while jumping around defenseless in the hopes that a worker will upgrade the priest hat first. The priest has no way of attacking save for wacking enemies on the head with his staff. Not very effective. However with the upgrade the priest can turn into a shadow priest type archetype. The priest can then target enemies and drain their health until the enemy is at a near death state. The priest can not kill anyone with this spell, but does gain health while their is health to be drained. To kill someone as a priest you must wack them with your stick. Draining health does slow down those buggers though, be evasive till you see their health is red, then go beat them up like the medic you are. So lets face it. You captured the other princess in Fat Princess. She’s in the dungeon, and she keeps screaming things like, "Cake Please!" and lets face it, you should feed her. The only problem is, immediately after feeding her she chimes in again: "FEED ME CAKE!". Despite the fact that after awhile it seems like torture for your little PS3 toon, it is in your best interest to keep her plump. So go out there, find that cake, and bring it back to her. Her overweight nature will create many difficulties for the other team attempting to carry her out the front door. Even though it seems the princess has an eating disorder, it appears things come in pairs, because the princess will also go from very heavy to rather skinny fairly quick. Let me just say: if she is losing the weight in a healthy manner, she could market and sell her scheme for millions. Back to the actual topic of our Fat Princess in gameplay: replacing the idea of a flag for a princess that dynamically is reflective of how much ‘attention’ she is given, is an excellent change of pace from the natural ‘wave-y’ material that most civilizations call flags. The Princess has some awesome voice-over work, and I find that everyone with a mic mimics the princess begging for cake, or they often respond with "The Cake is a lie!". To sum it up, the Princess is a nice idea that changes gameplay slightly in this PS3 game, but its still just capture the flag with an awesome spin to it. Will there be any? The main menu kind of suggests that there is some future content planned for this feud between red and blue. None has been promised, and when following the link that suggests "Phat Downloads" there is a blank Playstation Network Store screen. What’s interesting is that this screen doesn’t even contain the FatPrincess Themes, or trailers. I think this foreshadows some actual content in store for this game. But don’t trust me for it, this is all just speculation based off of what is in the game. There is so much hecticness and yet it seems like there could be so much more. As for updates, the connectivity issue has been fixed for the most part. I now have very ltitle trouble connecting to games on the Playstation Network, where as before the update I would wait for about thirty minutes before joining a game. Thank you Titan studios for releasing an update that fixes the problems. Fat Princess was at the top of my anticipation list since I saw the first gameplay footage. Like all dreams that come true, upon further inspection we find its flaws or things that we would change; however Fat Princess offers some crazy, spuratic, engaging, and memorable gameplay. 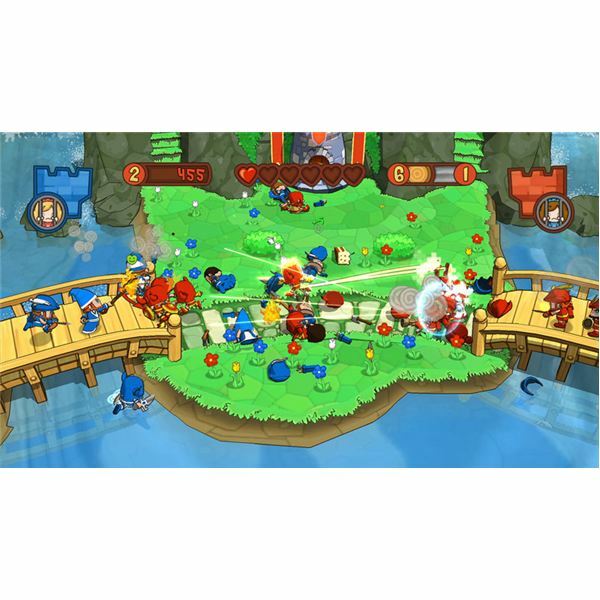 From the hectic battles where red blood squirts in every direction, to cooperatively taking bombs on the catapult with ten teammates, or feeding the inmate the game holds lasting fun out there for anyone willing to play. The only downside is that not many Playstation 3 owners have mics, and it would really impact the level of gameplay if ever server, every player had a voice. If only Sony packaged a cheaper bluetooth mic with their system, then this game would be perfect. Until then I’ll just yell at the few people who were silly enough to purchase mics, while we turn mages into chickens, and beautiful princesses into beautiful …. cake stuffed… you get the picture. Its only fifteen dollars, and you’ve got nothing to lose.